Washington - President Barack Obama on Thursday praised the contributions of Muslim immigrants to the United States, saying any effort to discriminate against the Islamic faith plays into the hands of terrorists. 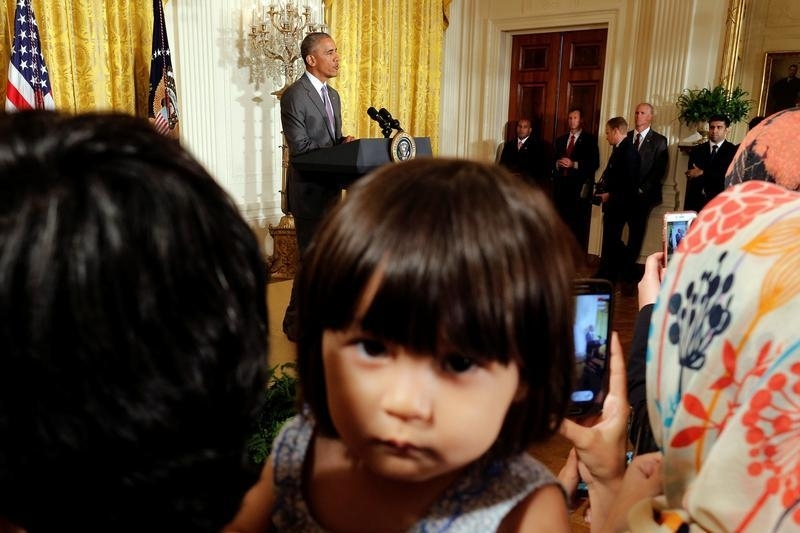 “Muslim Americans are as patriotic, as integrated, as American as any other members of the American family,” Obama said at a White House reception to celebrate the Muslim Eid al-Fitr holiday. “Whether your family has been here for generations or you’re a new arrival, you’re an essential part of the fabric of our country,” he said. Trump, who will be giving his official acceptance speech at the Republican National Convention on Thursday night, has used “make America great again” as his campaign slogan. We only have to listen to this moron for another few months with his political correctness. His legacy is ISIS and that's all. Discrimination against Muslims is as bad as discrimination against Christians. Bush created ISIS/Daesh and Obama perpetuated it. What kind of crazy parents did he have.? W hen I was a youngster here in N.Y.C. we hardly saw a chinese, let alone a moslem in full dress.I don't know what history books he read,that would have any mention of contribution of muslim culture mentioned here in the U.S.A. since its founding. There has been scant contributions to civilization by moslems since the 14th. century .They have no interest in their life here on earth and look towards death as the best thing. The religion that's called islam is not translated properly for us,as it means' submission'.and it's aim is to conquer the whole world and have everyone submit to them. Unreal how many times Obama has admonished us about how wonderful musilms are.... No wonder considering his father was muslim, Obama dressed in full muslim garb for his his muslim brother's wedding, and he is no doubt a mmuslim who only put on the show that he's Christian so he could infiltrate the White House and further his anti America agenda in favor of his brethren. Sickening. The name of the religion called "Christianity" means "followers of Christ", which here means Yoshke. It is a religion of murder in his name. And sharia law is also an affront to American values. Two can play at the same game, Mr. President. In this day and age, as it has whenever Muslims felt strong enough throughout history, they wage Jihad against everyone in the most brutal and violent way. What does the Torah say about Yishmael? Ma'ase avos......!!! They are clearly different than xtions are today, though xtions do a lot of harm to us and a case can surely be made that xtions that try to destroy our souls is worse than physical harm, Muslims only destroy and add nothing constructive to any society. Why would anyone think a MUSLIM can do terror? Its like those racists that when they see a group of 16 years old black "youth" in hoodies in pants that are falling off, cross the street. the demoRATS will vote for the machshaifa hillary even if it kills them doing it. They are ready to die themselves, trying to push their liberal/progressive/socialist agenda on ALL of US and America. When people get tired of beating on Muslims, which religious group might be next? “ In this day and age, as it has whenever Muslims felt strong enough throughout history, they wage Jihad against everyone in the most brutal and violent way. What does the Torah say about Yishmael? Ma'ase avos......!!! Al-Zahrawi was a Muslim. He is considered the father of surgery.